I wrote last week about Apple’s proposal submitted to the City of Cupertino for a new campus. This new campus, however, is unlike anything you’ve even seen. 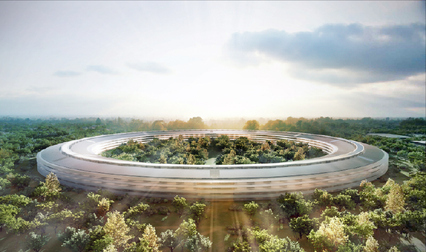 Basically, Apple wants their new campus to resemble a spaceship that has landed in Cupertino, California. The new campus, officially called Apple Campus 2, is replete with huge glass windows that make the outer shell of a massive doughnut shaped building that’s 2.8 million square feet with underground parking lots. According to the Silicon Republic, the 2.8m sq-foot, four-storey doughnut-shaped building features walls of glass that lets employees look out from both sides of the ring onto park-like landscaping adorned with 6,000 trees. The headquarters will contain 13,000 employees, a 1,000-seat auditorium, a corporate fitness centre, 300,000 sq feet of research facilities and underground parking, which will allow for 80pc of the 150-acre property to be landscaped with the trees. The primary energy source will come from Apple’s own energy building, which uses natural gas and other clean sources. The company will use the city’s grid as its backup source. Construction of the building is planned to begin next year with a completion date sometime in 2015. Architects Foster + Partners are working with ARUP North America and Kier & Wright, an engineering company that has worked on Apple’s current campus. According to Steve Jobs, Apple CEO, the company plans on keeping their current headquarters and using the new building as a way to expand their fast growing work force.